Seeing the state of AzhwAr who is having great attachment towards such emperumAn, those who previously nurtured his attachment try to disrupt his meditation seeing his distress. And those who know AzhwAr’s nature tell them “if you who first nurtured his attachment and now stop him, you will end up being disliked by him” and explain his great attachment towards emperumAn. AzhwAr is mercifully singing this scenario in the following manner – [AzhwAr in feminine mood as parAnguSa nAyaki] a consort of dhEvapirAn, emperumAn of thiruththolaivillimangalam dhivya dhESam who enjoyed and was immersed in him. Seeing her attachment, her mothers bring her to dhEvapirAn and make her worship his divine feet. Subsequently, seeing her overwhelming attachment, they try to stop her engagement with him. Seeing this, her dear friend who knows her heart explains her emotions to her mothers saying “When you first engaged her with him, did you do it without any desire? Now, you give up your attachment towards her [and let her go to emperumAn]”. Before and after this decad, AzhwAr praised emperumAn; in this decad, he speaks about himself. As per simhAvalOkana nyAyam [logic of lion walking back and forth to inspect the situation], AzhwAr is speaking in the mood of some one else, the great attachment he acquired in bhagavath vishayam starting from thiruviruththam 1st pAsuram “poynninRa gyAnamum” (false knowledge) until now. All our mudhaligaL (Acharyas, elders) would greatly like this decad saying “this decad is revealing AzhwAr’s nature”. Only AzhwAr who was blessed with divine wisdom by bhagavAn’s mercy to speak effortlessly about emperumAn who was said in thaiththirIya upanishath as “yathO vAchO nivarthanthE” (The speech returned unable to understand and glorify emperumAn), could speak about his own nature too. When SrIjanakarAjan thirumagaL (sIthAp pirAtti) was born, expert astrologers were invited and asked “How will she live?”, they said “She will have no shortcoming in her life; she will marry an emperor of the universe; yet she will have to live in the forest”; similarly when this girl (parAnguSa nAyaki) was born, her mother and others invited learned scholars and asked “How will she live?”; they replied “everything will be fine in the end; but there is a great danger for her; if she survives that, she will live prosperously. 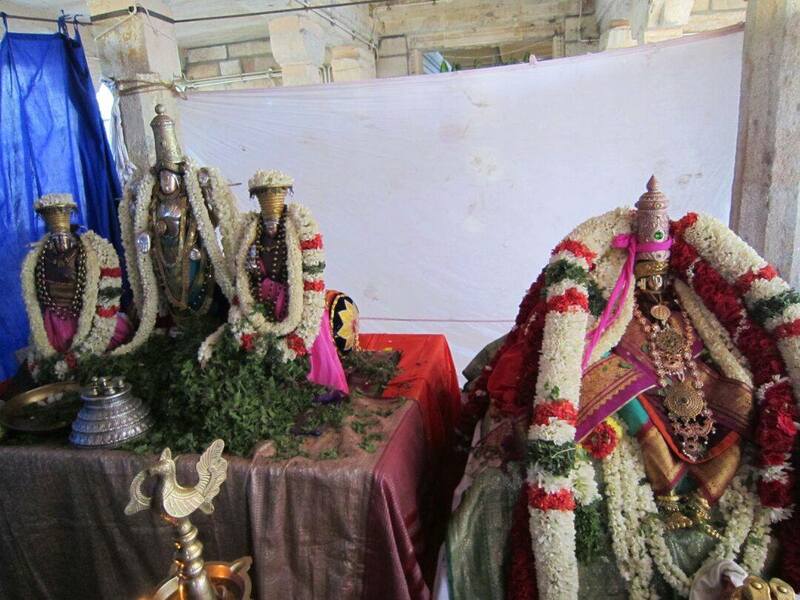 That is, if you don’t bring her to thiruththolaivillimangalam, she will survive”. But their clan is of the nature that they will bring her to thiruththolaivillimangalam even at the cost of losing her; they are of the nature that “let her go there and be finished”. Only when sIthAp pirAtti did not have to go through vanavAsam (time in forest), she too will not enter thiruththolaivillimangalam. SrI naLa’s words should be recollected. [When he was asked “Is it possible for us to build a bridge with rocks on the ocean?] SrI naLa said “Is it conceivable that perumAL (SrI rAma) could mercifully go to the forest, pirAtti could be captured by the demoniac rAvaNa, and perumAL feel anguished? If such things can happen, this could happen too”. Even though dhEhAthmAbhimAnis (those who consider body as soul) acquire vast knowledge, they still cannot change their thinking from “sthUlOham kruSOham” (I am thin, I am fat); similarly, AzhwAr too cannot be pulled back from dhivya dhESams even if various faults are identified in such abodes. Those who are attached to lowly pleasures cannot be pulled back by highlighting them as “adharmam” (unrighteous), “pazhi” (shame) and “mEl narakam” (this will lead to hell subsequently). Here, since AzhwAr’s attachment is in the matter which has so many auspicious qualities, he cannot be pulled back highlighting any faults. Even if some one sets out to highlight the faults, they will end up highlighting the good qualities only. That will only lead to [more] attachment. parAnguSa nAyaki’s faith is so firm that even if there is shame and disrespect, she will not give up. If such is the case, why are they [mother and others] trying to pull her back? They are being fearful thinking “she is not matured enough, yet she is having great attachment towards emperumAn; what if such desire consumes her and we lose her?”. [Another reason for their attempt to pull her back] Now, since great attachment is generally seen in sAdhakas (those who practice bhakthi yOga, upAsana etc which are based on self effort], they would try to pull her back fearing “what shall we do if she is pursuing emperumAn having such sAdhanA as means?”; [but] she thinks “only if such attachment crosses the limit of the true nature of self [of being totally dependent on him], it will become a means”. She thinks “If we accept the difference in the true nature [of bhagavAn and self, being lord and servitor], should we not accept the acts which align with such nature?”. [That is] As being the means fits the nature of SEshi [bhagavAn, lord], having great attachment fits the nature of SEShabhUtha [AzhwAr, servitor]. Now, what is the connection between previous decad and this decad? [bhattar’s explanation] As the water that is being drunk could cause hiccups and lead to a helpless state, while enjoying the qualities of krishNa, that experience itself leads to a different taste [archAvathAra emperumAn], and AzhwAr is speaking his anguish in the mood of someone else. That is, starting from thiruviruththam 1 “poynninRa gyAnam” until here, as he did not experience emperumAn fully, here he is mercifully explaining the great attachment. [pUrvAchAryas’ explanation] Alternatively, AzhwAr’s experience in previous decad was just an internal experience, and AzhwAr acquired the desire for external experience and became anguished on not acquiring the external experience which is explained by him in the mood of someone else [a consort in separation of her lord]. Though they [mother and others] knew her nature, without realizing the situation, brought her to thiruththolaivillimangalam and she started reciting “aravindhalOchana”, “dhEvapirAn” and emperumAn’s qualities such as simplicity, supremacy and his distinguished forms; seeing her state, they came to her friend thinking “we may lose her”, and told her “you know about her fully; you should identify the means to bring her back”; her friend said “first you triggered her attachment towards him and now what is the use in desiring to pull her back? As you are unable to pull her back, just give up your attachment towards her; instead of stopping her, you too help her to be uplifted!”. When the mother asks, it is the friend who is speaking; in bhagavath vishayam there is no concept of “old and new”; those who are dhESika (those who know the truth) can speak and those who are interested can listen. [SrI rAmAyaNam ayOdhyA kANdam 86.1 is highlighted as example for newer devotee instructing an existing devotee] SrI guhap perumAL explained the good qualities of iLaiya perumAL to SrI bharathAzhwAn as seen in “AchachakshE’tha sadhbhAvam lakshmaNasya mahAthmana:”. AchachakshE – He could speak about the glories which are beyond the ability of speech. atha – He spoke after knowing the greatness of SrI bharathAzhwAn. sadhbhAvam – He explained lakshmaNa’s nature and qualities as said in SrI rAmAyaNam bAla kANdam 18.27 “bAlyAth prabruthi susnigdha:” (being very loving towards SrI rama since childhood) and in SrI rAmAyaNam AraNya kANdam 15.7 “paravAnasmi” (I am totally dependent on SrI rAma). lakshmaNasya mahAthmana: – He started fetching water from the ocean using his hands [lakshmaNa’s glories are so vast]. bharathAya apramEyAya – There is no restriction that only certain persons can instruct certain other persons. guhO gahana gOchara: – guha who dwells in forest knowing the nature of the various varieties of trees, now became an expert in knowing about SrI lakshmaNa and SrI bharathAzhwAn. Alternative explanation – guha who had fallen apart and stayed in bushes due to separation from SrI rAma, became bold, speaking about SrI lakshmaNa to SrI bharathAzhwAn, after having met dhESika [SrI lakshmaNa]. This entry was posted in thiruvAimozhi, thiruvAimozhi 6th centum on January 28, 2018 by Sarathy Thothathri.